This bowl is a lifesaver when you’re super busy. It’s so easy to put together and contains the macros you need to supercharge your afternoon. Plus, it provides tartness, sweetness and crunch to awaken all your senses. Toast pumpkin seeds, sliced almonds and shredded coconut in oven at 400 F for approximately 10 minutes. Be sure to toss around the 5-minute mark. These keep well for the rest of the week in a covered glass bowl. Spoon Greek yogurt of your choice into a bowl. 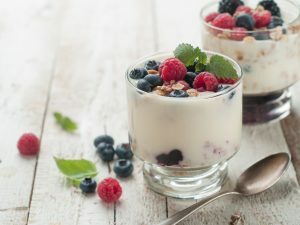 Layer the blueberries and raspberries (or your fruit of choice) on top of the yogurt. Add the pumpkin seed, almond, shredded coconut mixture on top. For some extra protein, drizzle honey almond butter over the top. This easy recipe keeps very well in a covered glass container for up to 5 days. Great to make ahead for the week and use in your favorite smoothie, too! *Super Swaps: This recipe is great to follow for any nut butters. Simply swap out almonds for cashews, hazelnuts, sunflower seeds, pecans, peanuts, etc. You can also add in cinnamon for extra flavor. In a medium bowl, cover the almonds with purified water. Add a dash of sea salt and let them soak overnight. Drain the almonds and place them on a paper towel to dry. Line a baking sheet with parchment paper and place almonds on the sheet in a single layer. Roast for about 5 minutes. Add the coconut oil to the food processor and continue to grind the nuts for 10 to 15 minutes, stopping to scrape down sides as needed. Add the honey and grind for another 10 minutes, stopping to scrape down sides as needed, until the butter is smooth and creamy.